Digital X-rays provide several advanced imaging options designed to save time, provide clearer dental photos, and expose patients to less radiation than with traditional X-ray technology. A small sensor, placed in your mouth, takes an image that is stored in our computer and instantly displayed on our computer screen. This elimiates typical x-ray film development time. 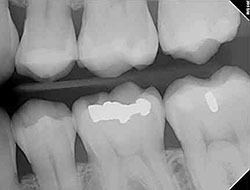 Our office can enlarge the image displayed on the screen to discover even the smallest dental problem. Most importantly, your exposure to radiation is 90% less using digital radiography rather than conventional x-ray machines. Our practice is focused on making your dental experience as comfortable as possible. At your next appointment, we'll be happy to answer any questions you may have.